**Note: Size small has an attached cape as pictured, but the medium and large sizes have a separate cape. Put the neighborhood on alert...this is going to be the year of Wonder Woman! At least it will be in your house. Ever since your when your girl met Princess Diana of Themys...er...Diana Prince--your home has been turned into an Amazonian playground. Your girl spends every waking moment reading about, watching, and living her Wonder Woman fantasies. She beats up the bad guys after breakfast, saves the planet from peril before lunch, and lassos the truth from everyone she meets by the time supper rolls around. 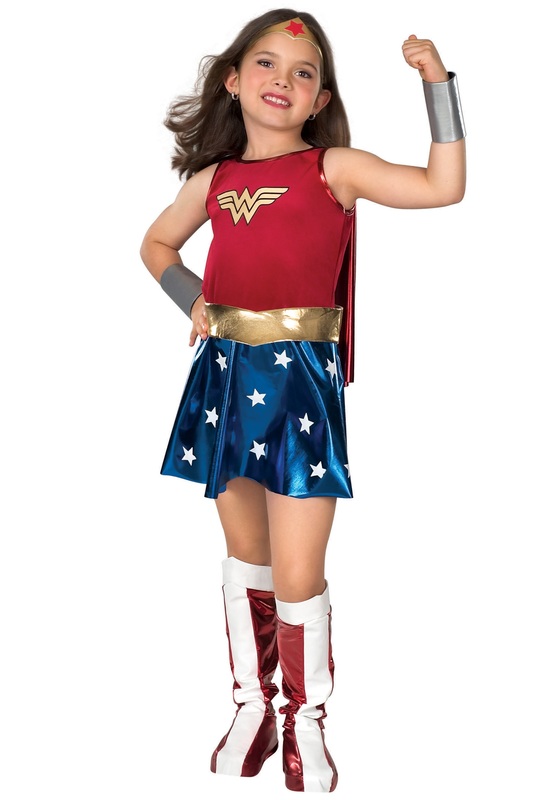 In this Kids Wonder Woman Costume, then, your little girl can bring her imaginative ideas to life and collect all the candy in one fell swoop before Halloween comes to a close. We trust she’ll keep the peace in the neighborhood all night long! Wearing this shining symbol of superhero strength, she can finally experience the epitome of her fandom and become Wonder Woman herself. She can coordinate her with her friends for a fun DC comic theme, or fly solo. But, we’re warning you, before you show her the striped boot toppers, red cape, gold tiara, and bulletproof bracelets of this costume, you may want to ask yourself just how ready you are to live with Wonder Woman day in and day out. Because like her hero, your little girl is powerful and strong-willed, and thus you may encounter a bit of a struggle convincing her to change out of the red tank shirt and star-printed blue skirt once she’s got it on. Well, what you can you do? That’s the price you pay for crafting a goddess-like warrior right under your own roof. Ordered from the U.S. late Monday evening, arrived in the UK Wednesday morning - crazy!!! !